One after another, the nation's most powerful Republicans responded to President Donald Trump's extraordinary remarks about white supremacists. Yet few mentioned the president. The Senate's top Republican, Majority Leader Mitch McConnell, condemned "hate and bigotry." House Speaker Paul Ryan charged that, "White supremacy is repulsive." Neither criticized the president's insistence that there were "very fine people on both sides" of a violent weekend clash between white supremacists and counterdemonstrators. The nuanced statements reflect the party establishment's delicate dance. Few top Republican officeholders defended the president in the midst of an escalating political crisis. Yet they are unwilling to declare all-out war against Trump and risk alienating his loyalists. And as the 2018 elections begin to take shape, the debate over Trump's words appears to be taking hold in GOP primaries. Mr. Trump's overall approval rating may be dismal, but a small group of die-hard supporters is expected to play an outsized role in next year's midterm elections when the Republican control of Congress is at stake. Those supporters are praising the president's response to the violence in Charlottesville, Virginia, which left one dead and many more wounded. They wash their hands of neo-Nazis and wag their fingers at leftists. But in the frenzied blame game over the deadly violence at a rally of white supremacists, Donald Trump's loyal base is happy to absolve the president himself. "You got racism in both factions, on both sides," former New Hampshire GOP chair Jack Kimball said. "Trump has zero fault here. None." 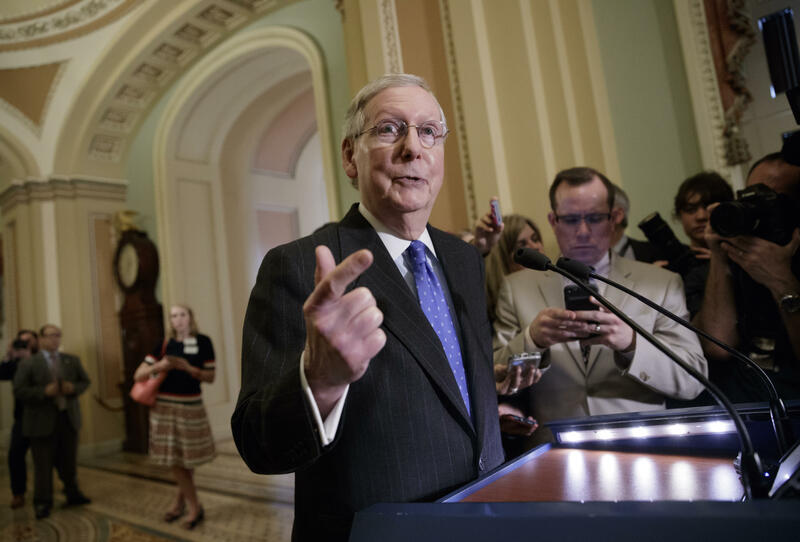 The delicate relationship helps explain Wednesday's cautious comments from powerful Republicans like McConnell. "We all have a responsibility to stand against hate and violence, wherever it raises its evil head," McConnell said in a statement, noting that white supremacists are planning a rally in his home state of Kentucky. Former Republican Presidents George H.W. and George W. Bush, usually silent on current political developments, released a joint statement that stopped short of criticizing Trump as well. "America must always reject racial bigotry, anti-Semitism and hatred in all forms," the Bushes said. The political tap dance frustrated as least one member of Mr. Trump's diversity council, CEO of the U.S. Hispanic Chamber of Commerce Javier Palomarez, who called Trump's response "a monumental failure in leadership." He challenged those who denounced racism in general terms without calling out the president by name. "That's a sign of weakness, and I don't think the American people and the Republican Party is going to forget," said Palomarez, who noted he would remain on Trump's diversity council "for now." But Trump loyalists on the ground in key states are ready to fight for their leader. And there were signs that the divide between the loyalists and establishment Republicans is already shaping the mid-term political landscape. "We've always had these weak skittish so-called Republicans in the D.C. crowd. They're always peeing their pants," said Corey Stewart, a former Trump aide who has already launched a 2018 Senate bid in Virginia. Many were quick to blame the media for Mr. Trump's struggles. "It doesn't take a rocket scientist to figure out the liberal media is not a fan of President Trump," said Trump's Alabama campaign chairman, Perry Hooper, arguing the Russia investigation is driven by media obsession. He added, "Now they're trying to make him some kind of racist. It's ridiculous. He doesn't have a racist bone in his body." Nevada Republican Danny Tarkanian, who is challenging Republican Sen. Dean Heller, said those criticizing Trump's response to the white supremacist rally were "splitting hairs." "It was clear the media went out of their way to find fault with his statement," Tarkanian said. Heller, who is considered one of the most endangered Republicans in the nation heading into the 2018 election, posted a simple statement on Twitter late Tuesday that stopped short of criticizing the president: "There is no defense or justification for evil in the form of white supremacists and Nazis. None," he wrote. The Republicans who lashed out at Trump most aggressively were, in many cases, those with the least to lose politically. South Carolina Republican Sen. Lindsey Graham, who doesn't face re-election until 2020, said the president "took a step backward by again suggesting there is moral equivalency between the white supremacist neo-Nazis and KKK members who attended the Charlottesville rally" and the people demonstrating against them. "Many Republicans do not agree with and will fight back against the idea that the party of Lincoln has a welcome mat out for the David Dukes of the world," Graham added, referring to the former Ku Klux Klan leader.